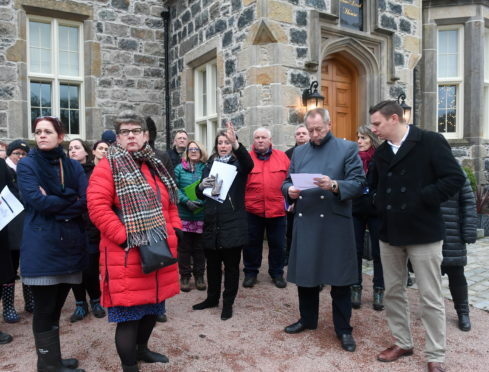 Aberdeenshire councillors visit the Menie Estate where Trump International wants to build luxury homes. Trump International is at loggerheads with planners over claims it has failed to provide vital information as it looks to get approval for its £150 million Menie Estate development. It is the latest stumbling block for the developer after a decision on the project, which consists of 550 homes, was pushed back from this month until later in the year with both sides blaming one another. Planners claimed the delay was caused by Trump International Golf Links Scotland submitting fresh information. But the organisation has branded this a “gross misrepresentation” of the facts. However, consultation responses which have been published on Aberdeenshire Council’s website reveal that a number of different departments, as well as the Scottish Environmental Protection Agency (Sepa), have said they cannot back the plans because there remain a number of unresolved issues. The council’s roads and environment officers have both claimed there are still unanswered questions which have not been resolved by the golf course owners. These include allegedly incomplete wildlife surveys and about 18 issues related to roads which have been branded inadequate. Meanwhile Sepa has also identified 10 areas related to flood risk which require more work. The environmental body has said it has maintained its objection claiming the proposals put wetlands at risk. The scheme includes 500 homes and 50 holiday cottages, plus shopping and food-and-drink outlets. Trump International’s legal representatve has now written a letter to the authority calling for a meeting with the council and the other organisations consulted. A letter from Mark McMurray, of firm CMS Cameron McKenna Nabarro Olswang LLP, states: “It is clear that the responses are aimed at frustrating the process and the only way that matters can be drawn to a close is by arranging a meeting to be held between the applicant’s professional team and the consultees, internal and external, with an interest in the outstanding queries. A petition for rejection has gained in excess of 16,000 signatures. About 3,000 formal objections have been submitted. Opponents have claimed the developer has broken its promise to build a hotel and second golf course as well as holiday homes. Trump International has threatened to walk away from further investment in the region if the plans are not approved.